Not long ago, UPS delivered a package that contained a board game, sent to the school by a kind stranger who thought we might like it. 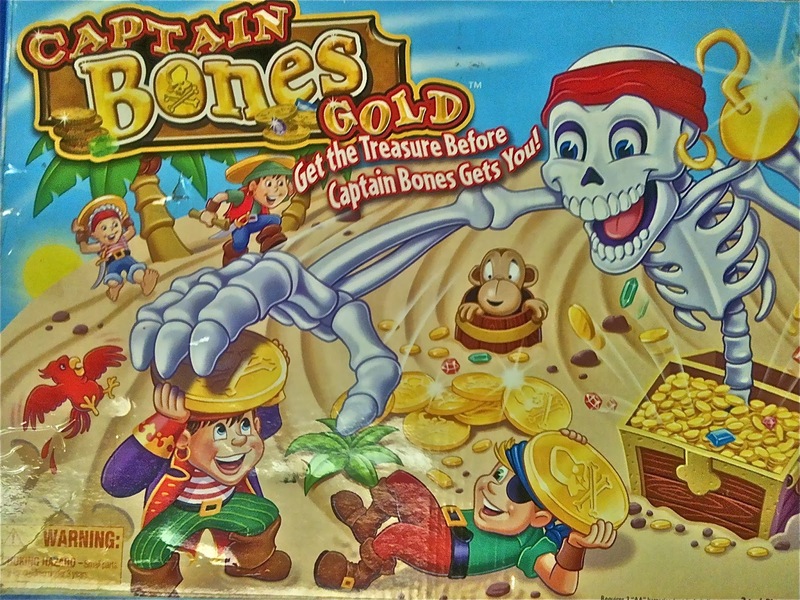 It wasn't a game with which I was familiar, Captain Bones Gold. It had obviously been previously used and a quick sift through the contents of the box revealed a plastic, batteries-required game board in the shape of an island, with a large treasure chest, a bag of smaller pieces, and no instructions. I put it on a shelf and promptly forgot about it until yesterday when I spotted it while looking for something else. I've written often here about my "middle class bag lady" tendencies and the fact that I must constantly fight the instinct to curate materials in our storage room, which is stacked floor to ceiling with other people's junk. It recent years, I've tried to deploy windfalls like Captain Bones Gold immediately, forcing new items to earn their keep before I grant them shelf space, but it arrived during the weeks between our summer program and the start of the school year leaving me with no choice but to stash it. Anders' mom Lindsey was the parent-teacher responsible for our workbench yesterday, so in the spirit of tinkering I handed her the box, saying, "Just let the kids figure this out." When she instinctively started opening the box, I said, "I wouldn't even do that for them." By the time she'd put it down, there was already a handful of kids curious about what was going on. A rotating group of kids then spent an hour, heads and hands together, figuring it out: tinkering around, discussing, debating, experimenting, struggling, and experiencing "ah hah" moments. At one point Anders came to me to ask for tape in order to make some repairs. When it was time to go, there were still kids there, including Audrey, who has, I was told, devised a set of rules for actually playing the game next time. That's right, they spent an hour, engaged with the project of this game, engaged with one another, employing their brains on a real-world project, and they didn't even get around to actually playing the game. People ask me quite often about standardized curricula like that encouraged by Common Core State Standards. There are a lot of reasons to dislike them, but perhaps the most important is simply that they are standardized. In a standardized curricula, there is little room for the kind of learning that comes from playing with things like Captain Bones Gold. 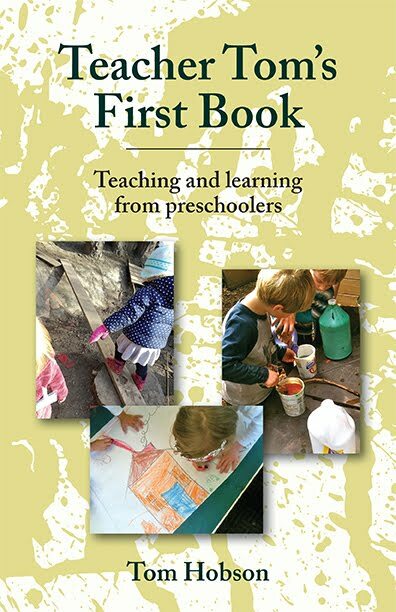 In most schools, public and private, with their out-of-the-box curricula, whole classrooms of similarly-aged children are expected to learn specific skills or bits of knowledge by certain target dates; trivia acquisition on a schedule with absolutely no empirical support. There is no research, for instance, that there is an ideal time by which a child should be able to count to 100 or read a certain number of words: it's pure guesswork on the part of the adults who designed it, and it's too bad for kids who either can't or won't learn these specific things on this arbitrary schedule. They're made to feel either inadequate or recalcitrant as teachers have to force feed this crap to kids who squirm, clown, and gaze out the window, "misbehavior" that is really evidence that they are desperate to learn, eager to learn, but just not this, just not now, and just not in this manner. 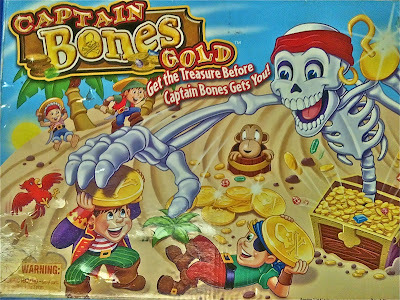 When we put Captain Bones Gold on a workbench and stand back, we are engaged in a state-of-the-art curricula, one that trusts children with their own education, one that allows children to learn exactly what they are curious about learning, when they are curious about it, and in the way that best satisfies their curiosity. As these children huddled around Captain Bones Gold, fiddling and forcing, arguing and agreeing, a dozen other kids were scattered around our outdoor space, constructing their own learning: their play driven by the own curiosity. Education is easy when it's based upon curiosity. Education through play is the most efficient model known to man. Standardizers make learning hard, hamstringing children from the start by removing curiosity and choice from the equation. They wind up serving a small, specific slice of kids, those who, by coincidence, are interested in learning this particular trivia at this particular time in this particular manner, while wasting the time of those who simply aren't at all curious about what's in their box.